A family of Omkar Settlement at Narere in Nasinu has expressed their appreciation of the Nasinu Town Council for ensuring the stream next to their house is cleaned daily. The remains of the home of the couple Mohammed Jannif and his wife Saira Bibi of earlier flooding was saved from more flooding over the weekend because of the cleared drain. “Two weeks ago our house was under water because of the clogging of the river due to a placing of a gothic mesh in the river by a company that is conducting development works on their land across the road,” Mr Jannif said. Had the council not taken quick action to clean the river clogged of rubbish daily after the last flood, there could have been more devastation for the household. The placement of the gothic mesh collected a large amount of rubbish, which blocked the flow of the water. “But after seeing the devastation and losses I suffered the council instructed the company to remove the gothic mesh and place something else that would not clog the river,” Mr Jannif said. He said the council had visited them after the last flood and was told by the officials he would receive assistance from the Council. “We are yet to get that assistance, though,” Mr Jannif said. 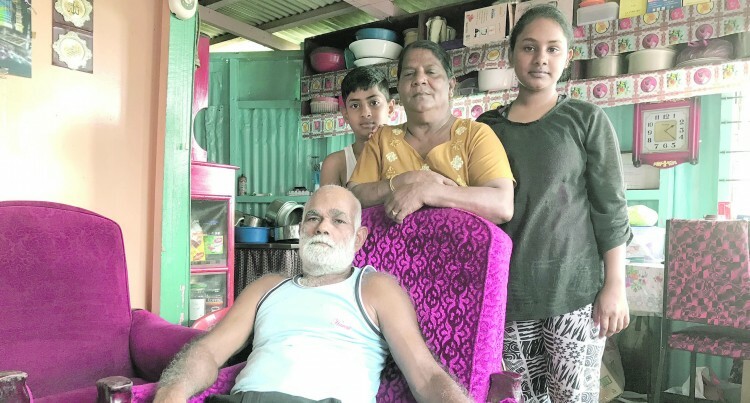 The couple was one of 68 families who received a 99-year lease block of land handed out by Acting Prime Minister and Attorney General Aiyaz Sayed-Khaiyum last month.